Thanks to Dr. Mingyi Chen, University of California Davis Medical Center (USA), for contributing this case and the discussion. To contribute a Case of the Week, follow the guidelines on our Case of the Week page. (1) We have updated the Joints chapter based on reviews by Vijay Shankar, M.D. (2) We have added new Board Review questions, courtesy of BoardVitals, which is accessible via our CME page. (3) We have recently updated these topics in our Stains and CD Markers chapters based on the reviews by Nat Pernick, M.D. 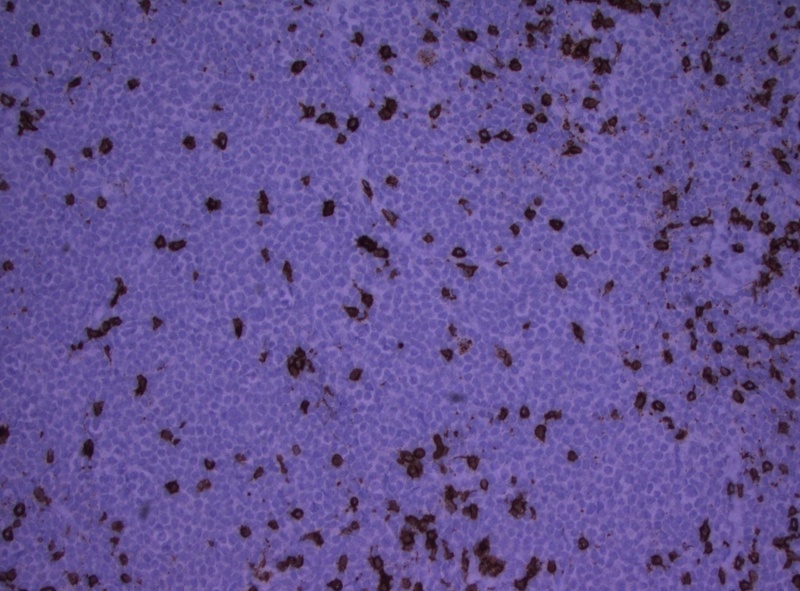 : CD Markers-general, CD1, CD1a, CD1b, CD1c, CD1d, CD1e, enzyme cytochemistry, 3 beta, 7 AAD, 14-3-3sigma, 15 PGDH, 45M1, ATM, Hansel stain, keratin AE1/AE3. We now have a plan to update all the Stains and CD Markers on a regular basis. 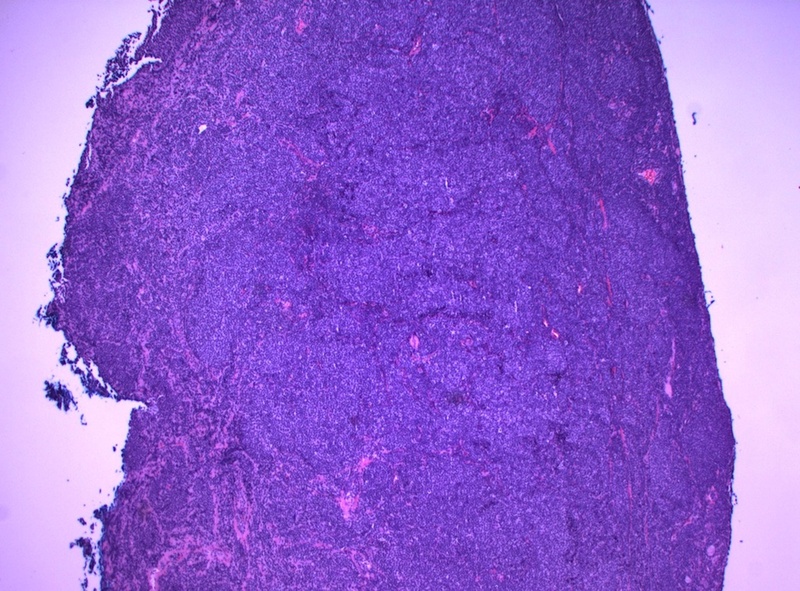 If topics are missing, or you are interested in doing a review, please contact us at comments@pathologyoutlines.com. (4) On 23 July 2013, we had record traffic of 18,131 visits. Let us know what we can do to make PathologyOutlines.com even more useful to you. 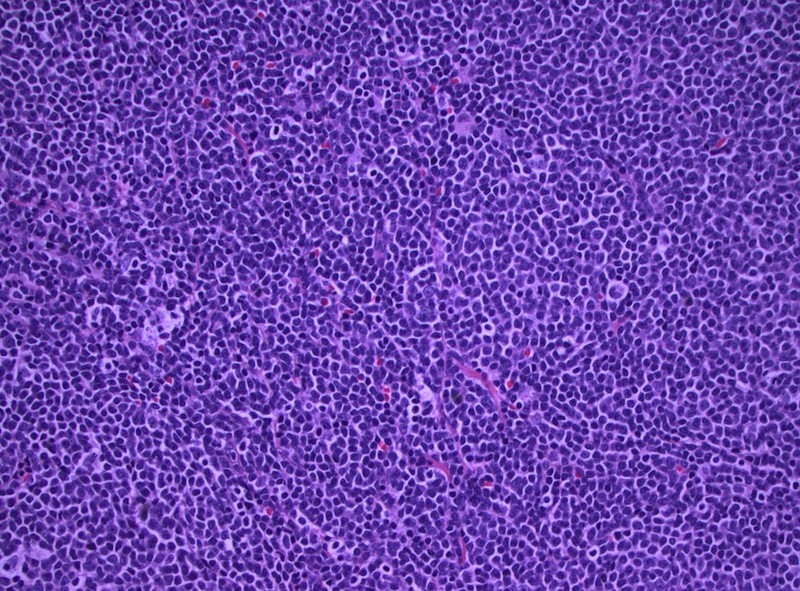 The H&E stained sections show sheets of an atypical lymphoid infiltrate with occasional hyalinized small vessels in the background. 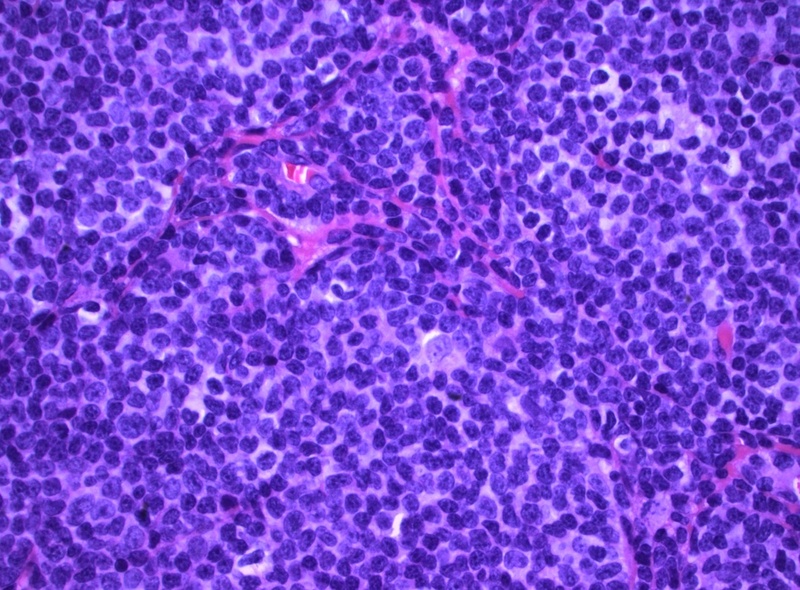 The tumor cells are monomorphic, small mature lymphocytes with scant cytoplasm, round to oval, cleaved nuclei, dense chromatin and inconspicuous nucleoli. No mitotic figures were seen. 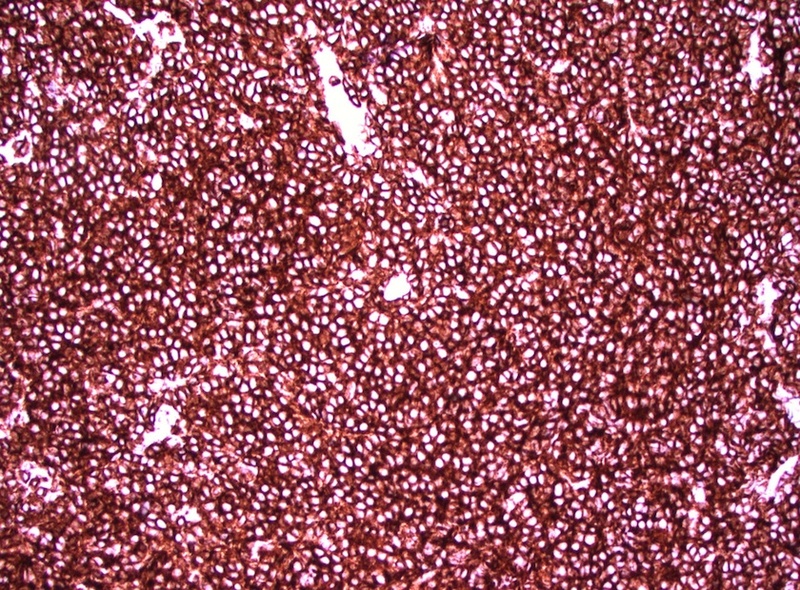 Flow cytometry (not shown) revealed monoclonal B cells with lambda light chain restriction, which coexpress CD19 and CD5. 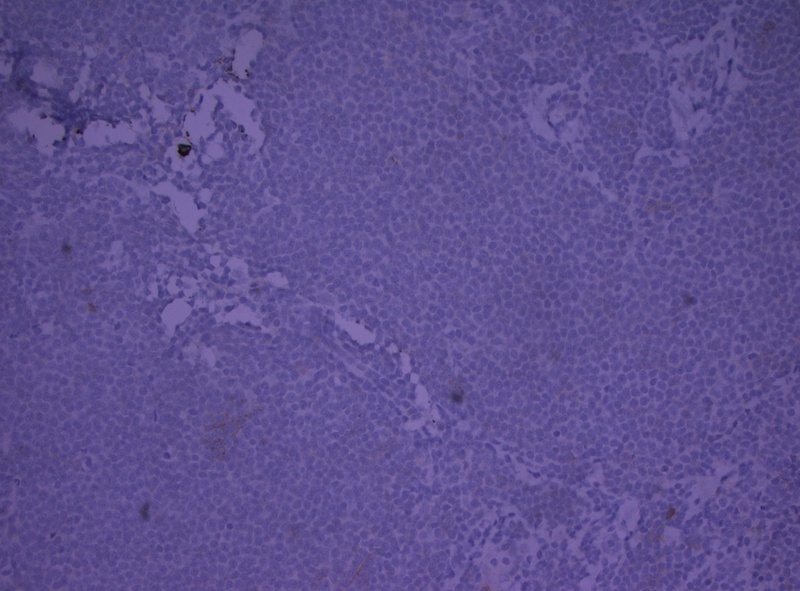 These cells were also positive for CD20 (bright) and FMC7, and are negative for CD23, CD10 and CD11C. 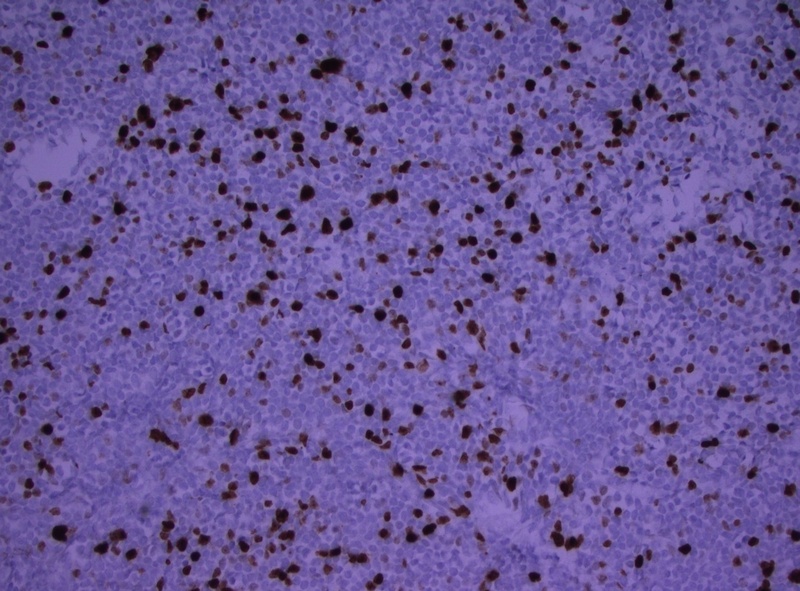 Immunostains demonstrated that the neoplastic cells were B cells (CD20+, PAX5+) with coexpression of bcl2, CD5, CD43 and cyclin D1, and they were negative for AE1/AE3, CD3, CD10, CD23 and CD30. 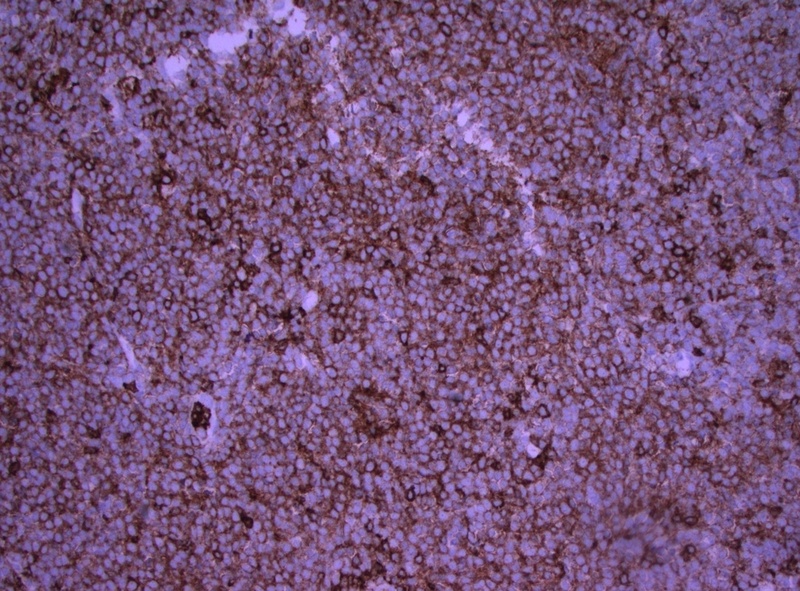 The cell proliferation index marker Ki-67 was 20-30%, confirming a relatively low grade process. Conventional cytogenetics analysis showed 46, XY, t(11;14)(q13;q32). 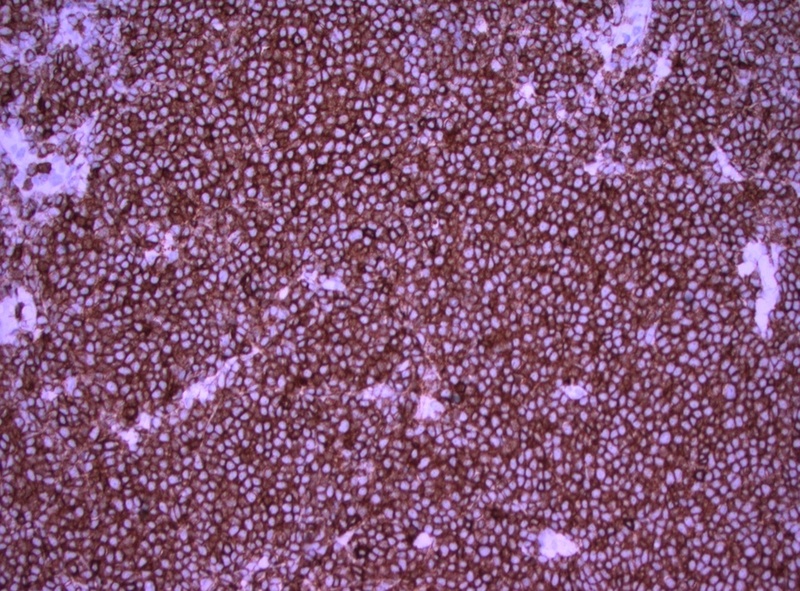 Ocular lymphomas can be primary or secondary, and occur in the orbit, conjunctiva and eyelids. 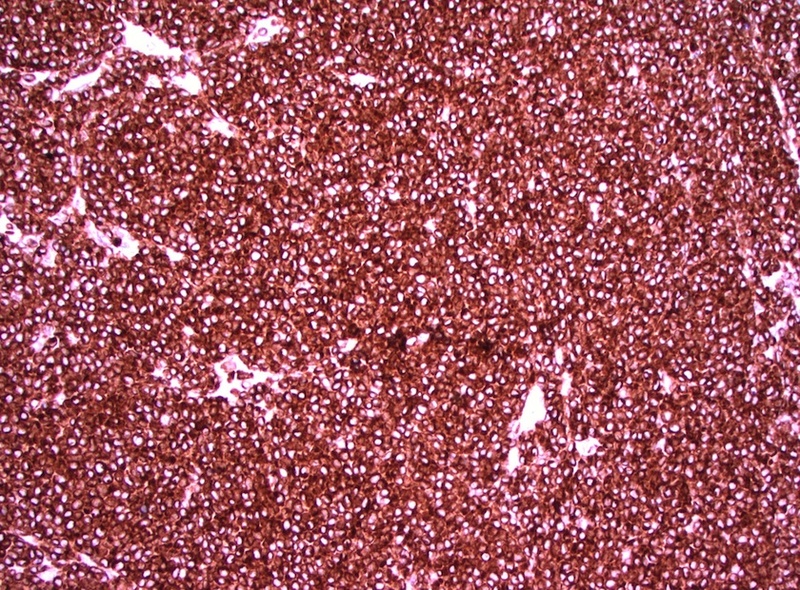 Most lymphomas in the ocular adnexa are B cell non-Hodgkin lymphomas, most commonly extranodal marginal zone B cell lymphoma of mucosa associated lymphoid tissue (MALToma). 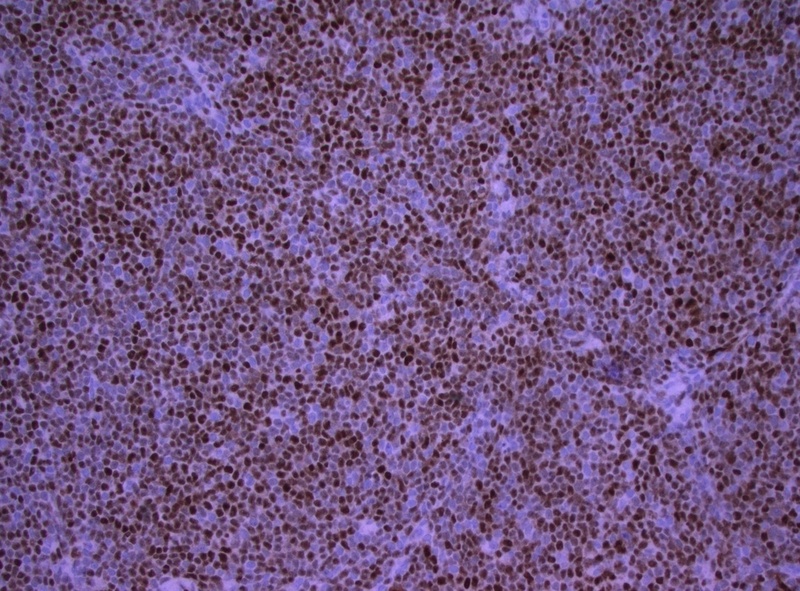 Less common B cell subtypes include lymphoplasmacytic lymphoma, mantle cell lymphoma, plasmacytoma and follicular lymphoma. 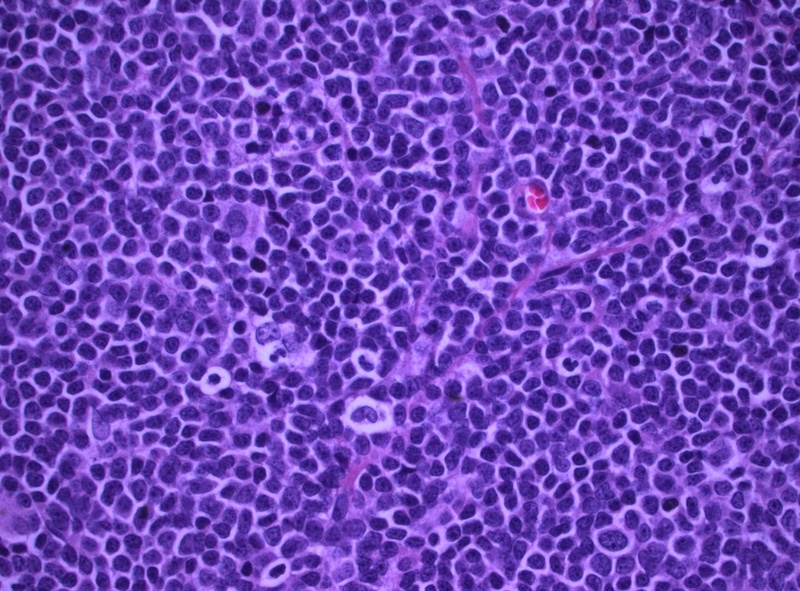 At all sites, mantle cell lymphoma (MCL) represents 3-5% of non-Hodgkin lymphomas. It predominantly occurs in older ages with a higher frequency in men, usually presenting with widespread disease and an aggressive course. 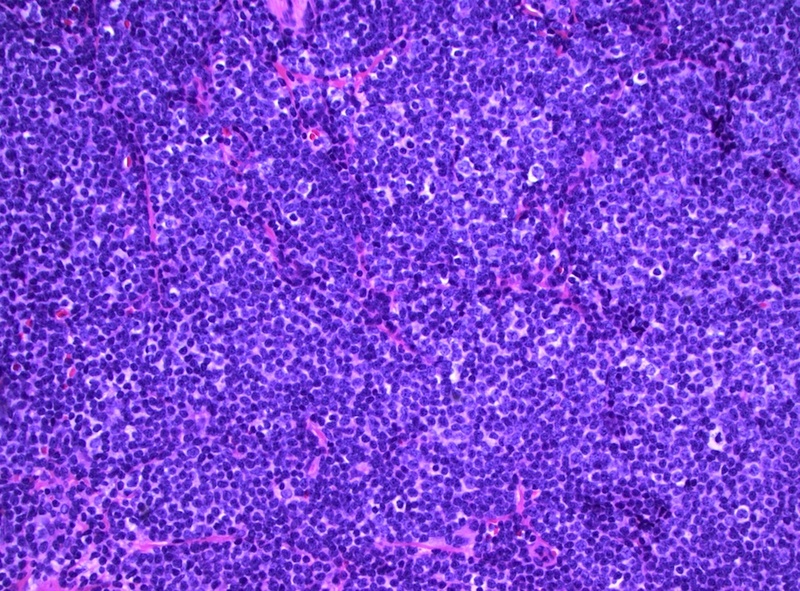 Mantle cell lymphoma most commonly occurs in lymph nodes and in the GI tract, but it presents as secondary involvement of ocular adnexal structures in 6% of the ocular lymphomas. 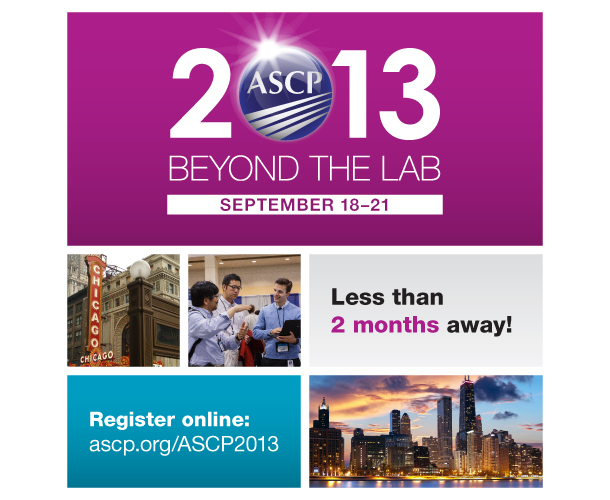 There are limited studies of primary ocular mantle cell lymphoma.